Abstract problems about attainability in topological spaces are considered. Some nonsequential version of the Warga approximate solutions is investigated: we use filters and ultrafilters of measurable spaces. Attraction sets are constructed. AMS (MOS) subject classification. 46A, 49 K 40. This investigation is devoted to questions connected with attainability under constraints; these constraints can be perturbed. Under these perturbations, jumps of the attained quality can arise. If perturbation is reduced to a weakening of the initial standard constraints, then we obtain some payoff in a result. Therefore, behavior limiting with respect to the validity of constraints can be very interesting. But, the investigation of possibilities of the abovementioned behavior is difficult. The corresponding “straight” methods are connected with constructions of asymptotic analysis. Very fruitful approach is connected with the extension of the corresponding problem. For example, in theory of control can be used different variants of generalized controls formalizable in the corresponding class of measures very often. In this connection, we note the known investigations of J. Warga (see ). We recall the notions of precise, generalized, and approximate controls (see ). In connection with this approach, we recall the investigations of R.V. Gamkrelidze . For problems of impulse control, we note the original approach of N.N. Krasovskii (see ) connected with the employment of distributions. If is useful to recall some asymptotic constructions in mathematical programming (see [4,5]). We note remarks in [4,5] connected with the possible employment of nonsequential approximate (in the Warga terminology) solutions-nets. The above-mentioned (and many other) investigations concern extremal problems. But, very important analogs are known for different quality problems. We recall the fundamental theorem about an alternative in differential games established by N.N. Krasovskii and A.I. Subbotin . In the corresponding constructions, elements of extensions are used very active. Moreover, approximate motions were used. The concrete connection of generalized and approximate elements of the corresponding constructions was realized by the rule of the extremal displacement of N.N. Krasovskii. In general, the problem of the combination of generalized and approximate elements in problems with constraints is very important. Namely, generalized elements (in particular, generalized controls) can be used for the representation of objects arising by the limit passage in the class of approximate elements (approximate solutions). These limit objects can be consider as attraction elements. Very often these elements suppose a sequential realizetion (see ). But, in other cases, attraction elements should be defined by more general procedures. So, we can consider variants of generalized representtation of asymptotic objects. This approach is developed by J. Warga in theory of control. Similar problems can arise in distinct sections of mathematics. For example, adherent points of the filter base in topological space can be considered as attraction elements. Of course, here nonsequential variants of the limit passage are required very often. In the following, the attainability problem with constraints of asymptotic character is considered. Fix two nonempty sets and H, and an operator h from into H. Elements of are considered as solutions (sometimes controls) and elements of H play the role of estimates. We consider h as the aim mapping. If we have the set of admissible (in traditional sense) solutions, then play the role of an attainability domain in the estimate space. But, we can use another constraint: instead of a nonempty family of subsets of E is given. In this case, we can use sequences in with a special property in the capacity of approximate solutions. Namely, we require that the sequence has the following property: for any the inclusion takes place from a certain index (i.e. for where is a fixed index depending on ). For such solutions we obtain the sequences in H. If H is equipped with a topology t, then we can consider the limits of such sequences as attraction elements (AE) in (H,t) Of course, our AE are “sequential”: we use the limit passage in the class of sequences. This approach can be very limiting. The last statement is connected both with our family and with topology The corresponding examples are known: see [7,8]. In many cases, the more general variants of the limit passage are required. Of course, we can consider nets in and, as a corollary, the corresponding nets in H. In addition, the basic requirement of admissibility it should be preserved: for any the inclusion is valid starting from a certain index. With the employment of such nets, we can realize new AE; this effect takes place in many examples. But, the representation of the “totality” of above-mentioned ( -admissible) nets as a set is connected with difficulties. Really, any net in the set is defined by a mapping from a nonempty directed set (DS) into the concrete choice of is arbitrary ( is a nonempty set). Therefore we have the very large “totality” of nets with the point of view of traditional Zermelo axiomatics. But, this situation can be corrected by the employment of filters of it is possible to introduce the set of all -admissible filters of the set In addition, the -admissibility of a filter is defined by the requirement So, we can consider nonsequential approximate solutions (analogs of sequential approximate solutions of Warga) as filters of with the property Moreover, we can be restricted to the employment of only ultrafilters (maximal filters) with the above-mentioned property. In two last cases, we obtain two variants of the set of admissible nonsequential approximate solutions defined in correspondence with Zermelo axiomatics. In our investigation, such point of view is postulated. And what is more, we give the basic attention to the consideration of ultrafilters. Here, the important property of compactness arises. Namely, the corresponding space of ultrafilters is equipped with a compact topology. This permits to consider ultrafilters as generalized elements (GE) too (we keep in mind the above-mentioned classification of Warga). The basic difficulty is connected with realizability: the existence of free ultrafilters (for which effects of an extension are realized) is established only with the employment of axiom of choice. Roughly speaking, free ultrafilters are “invisible”. This property is connected with ultrafilters of the family of all subsets of the corresponding “unit”. But, we can to consider ultrafilters of measurable spaces with algebras and semialgebras of sets. We note that some measurable spaces admitting the representation of all such ultrafilters are known (see, for example, [9,§7.6]; in addition, the unessential transformation with the employment of finitely additive (0,1)-measures is used). We use the standard set-theoretical symbolics including quantors and propositional connectives; as usually, replaces the expression “there exists and unique”, is the equality by definition. In the following, for any two objects and , is the unordered pair of x and y (see ). Then, is singleton containing an object x. Of course, for any objects x and the object is the ordered pair of objects x and y; here, we follow to . By we denote the empty set. By a family we call a set all elements of which are sets. By we denote the family of all subsets of a set then, are the family of all nonempty subsets of X. Of course, for any set in the form of and we have the family of all nonempty subfamilies of and respectively. of course, in (2.1) nonempty families are defined. If then is a measurable space with an algebra of sets. Of course, in (2.17), we use the usual duality property connected with (2.14) – (2.16). if then TS is called -space. We use (2.18) under investigation of properties of topologies on ultrafilter spaces. Finally, we suppose that . So, we introduce “continuous” lattices. In this section, we fix a nonempty set considered (in particular) as the space of usual solutions. We consider families as constraints of asymptotic character. Of course, in this case, we use asymptotic version of solutions. The simplest variant is realized by the employment of sequences in : in the set the set of -admissible sequences (see Section 1) is selected. It is logical to generalize this approach: we keep in mind the employment of nets. Later, we introduce some definitions connected with the Moore-Smith convergence. But, before we consider the filter convergence. If then by (by we denote the set of all filters (ultrafilters ) such that . Then, for any filter , we have and what is more is the intersection of all ultrafilters see . If a family is considered as the constra int of asymptotic character, then ultrafilters are considered as (nonsequential) approximate solutions; of course, filters can be considered in this capacity also. But, ultrafilters have better properties; therefore, now we are restricted to employment of ultrafilters as approximate solutions. From (3.6) and (3.7), we obtain that (3.8) is the “usual” Moore-Smith convergence (see ). Of course, any sequence generates the net where is the usual order of . If , then a net in is called -admissible if In this case, can be considered as a constraint of asymptotic character and plays the role of nonsequential (generally speaking) approximate solution. In (3.9), trivial ultrafilters are defined. In this section, we construct nonsequential (generally speaking) attraction sets (AS) using different variants of the representation of approximate solutions. Since nets are similar to sequences very essential, we begin our consideration with the representation (of AS) using nets. So, by (4.2) image of an ultrafilter base is an ultrafilter base. Of course, the image of an ultrafilter is an ultrafilter base also. we consider as AS. In this definition, we use nets. But, for any filter there exists a net in the set X for which (see ). By (4.5) and (4.8) The inclusion is established. Then, The inclusion is established. Recall that, for any family and We note the following obvious. Proposition 4.3. For any , the equality is valid. It is obvious the following. Using (4.15), we obtain the required statement about the nonemptyness of attraction set. So, in (4.24), the set of homeomorphisms is defined. In the following, (5.2) plays the very important role. The following reasoning is similar to the construction of [13,§3.6] connected with Wallman extension; in addition, later until the end of this section, we suppose that (5.10) is valid (so, we fix a lattice with “zero” and “unit”). (so, under (5.10), the statement (5.4) is amplified). In (5.13), we have the lattice of subsets of This important fact used below. follows. By these properties (see (6.6)) the constructions of Section 3 obtain interpretation in terms of filters and ultrafilters of measurable spaces. Since the choice of was arbitrary, the property (6.8) is established. In this and following sections, we fix a nonempty set and a lattice We consider the question about constructing a compact -space with “unit” This space is similar to Wallman extension for a -space. But, we not use axioms of topology and operate lattice constructions (here, a natural analogy with constructions of  takes place). Later we use the following simple statement. Therefore, by (2.13) the required statement is realized. Then, the intersection of all sets of is not empty. Since the choice of was arbitrary, it is established that any nonempty centered family of closed (in TS (7.6)) sets has the nonempty intersection. So, TS (7.6) is compact (see [11-13]). So, by (7.13) we obtain that (7.12) is a nonempty compact -space. With the employment of (7.15) the following statement is established. Of course, for any the inclusion is valid. is established. The inverse inclusion is obvious (see (7. 11)). So, we obtain that trivial ultrafilters (8.2) realize an everywhere dense set in the TS (7.12). If then see (8.12). Therefore, by (5.3) and, as a corollary, So, Therefore (see (8.16)) and coincide. Since the choice of F was arbitrary, from (8.19) we obtain the required continuity property (see [16, (2.5.2)]). moreover, see (7.13)). So, we have the “usual” Wallman extension. Returning to (9.2) in general case, we note the following obvious Proposition 9.1.
is established. So, we obtain the required equality. From (6.4), (8.8), and Proposition 9.1, the simple (but useful) statement follows. From (2.10), (5.4), and (9.11), the property (9.9) follows. in established. From (9.13) and (9.18), the required statement follows. Then, by (9.23) Since the choice of was arbitrary, by (9.1) So, (9.21) is established. In (9.25), the statement of the premise has the following sense: algebra is distinguishing for points of . 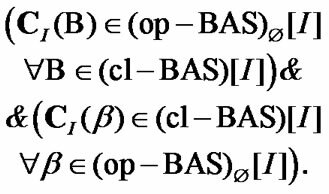 By analogy with (9.29) we note that and These properties permit realize an asymptotic analogs of solutions of the set (9.28). In this capacity, we can use elements of the sets and where is used as “asymptotic constraints”. 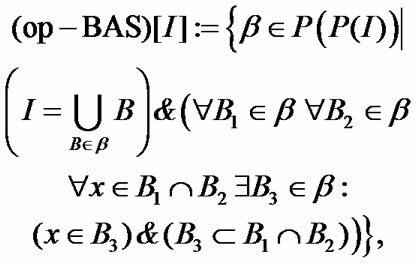 Of course, bounds our possibilities: we can use only subfamilies of . is established. The opposite inclusion is obvious. is supposed not; in Section 8 (in particular, in Proposition 8.1), the condition similar to (9.34) is essential. So, Proposition 9.4 has the independent meaning. Of course, we use remarks of the conclusion of the previous section. From the definition of and (10.8), we obtain (10.2). Since the choice of was arbitrary, the required inclusion (10.10) is established. By (10.18) we establish the natural connection of and Now, we consider some other auxiliary properties. The proof of (10.21) is completed. Now, with the employment of (10.26), we obtain (10.25). Using the last implication and (10.28), we obtain the required property (10.27). Remark 10.5. Consider the proof of (10.30), fixing and Then, by (10.15) In particular (see Section 9), Now, (10.30) follows from (10.27). Remark 10.6. It is possible to consider Condition 10.1 as a weakened variant of the measurability of The usual measurability of is not natural since is only algebra of sets. Until the end of the present section, we suppose that Condition 10.1 is valid. as an unessential transformation (see [9,§7.6] and [16,§ 2.4]; here it is appropriate to use the natural connection of ultrafilters and finitely additive (0,1)-measures). Then, after unessential transformations, the examples of [9,§ 7.6] can be used in our scheme sufficiently constructively. So, we introduce the limit sets corresponding to ultrafilters of By analogy with Proposition 5.4 of  the following statement is established. The uniqueness of is obvious. Since the choice of was arbitrary, we obtain that (11.18) is fulfilled. Then, by (3.5) Therefore, for any there exists such that (see (3.3) and (4.1)). The opposite inclusion was established previously. Therefore, and the intersection of all sets coincide. So, ultrafilters of realize very perfect constraints of asymptotic character. By (11.5) So, (12.1) is established. We recall (10.23) and (10.24): if then and (see (4.1)). We use (10. 15). From (12.8), the inclusion follows. So, the mapping is continuous at the point . Since the choice of was arbitrary, the required inclusion (12.10) is established (see , (2.5.4)). In connection with Proposition 12.5, we recall Proposition 9.2 and known statement about the possibility of an extension of continuous functions defined on the initial space; in this connection, see, for example, Theorem 3.6.21 of monograph . For this approach, constructions of Section 8 are essential. Of course, under corresponding conditions, we can use the natural connection with the Wallman extension (see (8.27) and Proposition 9.2). Proposition 12.6. The equality is valid. In (12.25), we have the important particular case. We consider this case in the following section. From (13.9) and (13.11), we have the property: for some we obtain that . We note that, in Theorem 13.1, the set plays the role of the set of admissible generalized solutions. In our investigation, one approach to the representation of AS and approximate solutions is considered. This very general approach requires the employment of constructions of nonsequential asymptotic analysis. This is connected both with the necessity of validity of “asymptotic constraints” and with the general type of the convergence in TS. We fix a nonempty set of usual solutions (the solution space), the estimate space, and an operator from the solution space into the estimate space. In the estimate space, a topology is given. Then, under very different constraints, we can realize in this space both usual attainable elements and AE. But, if usual attainable elements are defined comparatively simply (in the logical relation), then AE are constructed very difficult. For last goal, extensions of the initial space are used. In addition, the corresponding spaces of GE are constructed. Ultrafilters of the initial space can be used as GE. But, the realizability problems arise: free ultrafilters are “invisible”. In addition, free ultrafilters realize limit attainable elements which nonrealizable in the usual sense. In this connection, we propose to use ultrafilters of (nonstandard) measurable space; we keep in mind spaces with an algebra of sets. But, it is possible to consider the more general constructions with the employment of ultrafilters. In our investigation, ultrafilters of lattices of sets are used. On this basis, the interesting connection with the Wallman extension in general topology arises. It is possible that the proposed approach motivated by problems of asymptotic analysis can be useful in other constructions of contemporary mathematics. J. Warga, “Optimal Control of Differential and Functional Eguations,” Academic Press, New York, 1972. R. V. Gamkrelidze, “Foundations of Optimal Control Theory,” Izdat. Tbil. Univ., Tbilissi, Russian, 1977. N. N. Krasovskii, “The Theory of the Control of Motion,” Nauka, Moscow, Russian, 1968. R. J. Duffin, “Linear Inequalites and Related Systems,” Annals of Mathematics Studies, Vol. 38, 1956, pp. 157- 170. E. G. Gol‘stein, “Duality Theory in Mathematical Programming and Its Applications,” Nauka, Moscow, Russian, 1971. N. N. Krasovskii and A. I. Subbotin, “Game-Theoretical Control Problems,” Springer Verlag, Berlin, 1988. A. G. Chentsov, “Constructing Operations of the Limit Passage with the Emploument of Ultrafilters of Measurable Spaces,” Avtomatika i telemekhanika, Vol. 6, No. 11, 2007, pp. 208-222. 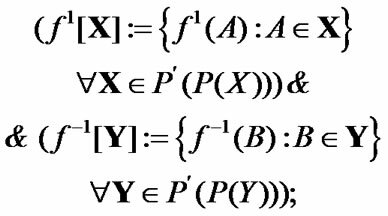 A. G. Chentsov and S. I. Tarasova, “Extensions of Abstract Analog of Unstable Control Problems,” Functional Differential Equations, Vol. 16, No. 2, 2009, pp. 237-261. A. G. Chentsov, “Asymptotic Attainability,” Kluwer, Dordrecht, 1997. K. Kuratowski and A. Mostowski, “Set Theory,” NorthHolland, Amsterdam, 1967. N. Bourbaki, “General Topology,” Nauka, Moskow, Russian, 1968. J. L. Kelley, “General Topology,” Van Nostrand, Prnceton, NJ, 1957. R. Engelking, “General Topology,” PWN, Warszawa, 1977. G. Crätzer, “General Lattice Theory,” Akademie-Verlag, Berlin, 1978. J. Neveu, “Bases Math Matiques Du Calcul Des Probabilit s,” Masson, Paris, 1964. A. G. Chentsov and S. I. Morina, “Extensions and Relaxations,” Kluwer Academic Publishers, Dordrecht/ Boston/London, 2002. A. G. Chentsov, “Some Constructions of Asymptotic Analisis Connected with Stone-Čech Compactification,” Contemporary Mathematics and its Applications, Vol. 26, 2004, pp. 119-150. 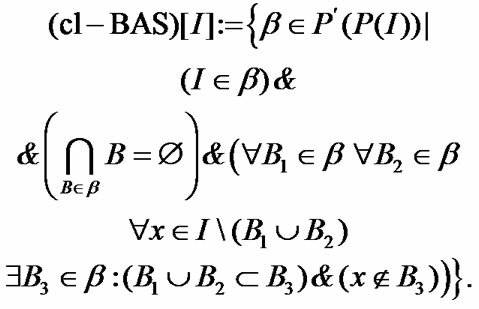 A. G. Chentsov, “Extensions of Abstract Problems of Attainability: Nonsequential Version. Proceedings of the Steklov Institute of Mathematics,” Suppl. 2, 2007, pp. S46-S82. Pleiades Publishing, Ltd., 2007.